Finally ordered the turkeys yesterday afternoon from Cackle Hatchery. I purchased from them last year and they were great to work with. Ordered 9 Broad Breasted Whites and 15 Bourbon Reds. In addition, thought I'd try the short commitment timeframe and raise 10 cornish chickens for meat. Part of the order process is to let them know when you would like the birds sent. Due to the current date, upcoming holiday, and impending announcing job, I selected June 6 or 8 on their shipping calendar, but noted if that's not possible "earlier is better than later." Not 30 minutes after I got home, I received a phone call. It was Cackle asking if I wanted them NOW! As in they hatched today and can go in the mail this evening. Chicks should be at the farm as early as tomorrow morning. Guess I have some prep to do quickly!! Also, coming soon? FENCING!! Received the final estimate from the companies I talked to about doing some fencing projects. Specifically up to 3 different projects -- redoing the main pasture, adding a "front field" paddock and adding a new "west" paddock. Nothing left but making the decision. Well, not really... I have emailed the last company a couple questions. Of 5 estimates, I'm down to possibly 3 I think would do the best job for the money. Hoping to make a decision by the end of the weekend and get started ASAP. So keep an eye out for updates including pictures coming soon! It's definitely springtime. VERY busy lately as is probably fairly typical for anyone on a farm. Here's some details on what's been going on. Fencing: After the fiasco that was the cows coming home... them promptly running off, I'm looking into getting some significant fence work done. Hopefully I'll have all the estimates in this week and whomever gets chosen to do the work (whatever amount of work that may be when all is said and done) can get started asap. Horse Shows: Had a lot of fun at the Stillwater Pony Club Hunter Show (DLSC) a couple weeks ago. Exhausting day as they had a lot of participation which as anyone knows with hunter shows means the day goes on forever. Raz was good, although we had some hinkey moments here and there. My ankle was not 100% from twisting it following the cow escapade the weekend before, but we managed 1 warmup round and the 3 classes in the Baby Hunter (2') division. 6th (of 6) in the Under Saddle class where I thought we did a decent job overall. 6th (of 16) in the first Over Fences class which frankly surprised me that we placed. And 7th of 7 in the 2nd after a major boggle at the 2nd fence caused me to lose my stirrup on the side with the bad ankle so I pulled her down to a walk to readjust. 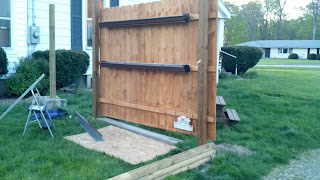 It's ok. We had some REALLY nice fences and I was ok with our performance. Unfortunately that will be our last show for a while. Not only do I have a couple announcing jobs coming up that interfere with the DLSC schedule (Greater Dayton Horse Trials and IEA Horse Trials) as well as relatives visiting for the Memorial Day weekend, but there has been a medical issue pop up. If you haven't heard about it, I'm surprised as the word is spreading pretty rapidly. One of the horses at iTolt Training Center came up with a positive Coggins - the test for Equine Infectious Anemia (EIA). Unfortunately, he also tested positive on a second blood draw and was humanely euthanized this past weekend. EIA is very contagious and even though Sam was only a carrier and never sick, the policy of the state is very clear and Jen did what a responsible owner has to do in this situation. This is the first positive in the state in 4 years, so it's not very common in this area. Unfortunately it does result in the barn being quarantined for 60 days. Thankfully, the blood draw on Monday for all the horses at the barn came back with all negatives. They will all be retested at 30 and 60 days before the quarantine is lifted. You can read the whole story, including timeline, valuable information about EIA, and the lovely story of who Sam was at iTolt's blog -- The Facts of our Positive Coggins Test Jen and everyone at iTolt are extremely good friends and I'm thankful for each of them and wish them nothing but peace in such a heartbreaking situation. So the pressure is off for a while, which will be nice. The plan is to catch up on things at the farm, NOT go completely crazy the next few busy weekends, and then work on some equitation issues with my riding while enjoying the ponies at the farm (under quarantine obviously no one is allowed to leave the farm)... and then find some fun shows to go to later in the summer. Speaking of horses... time to support my former pony and her fantastic owner!! Suzie and Frankie are doing such remarkable things. In an effort to help fund a trip to work with a great trainer this summer (Jan Bynny) prior to the Richland Park Horse Trials in August (and hopefully Fair Hill Horse Trials CCI*** in October), Suzie has created "Team Frankie" t-shirts. They're available in Blue or White and have a list of 10 things Frankie thinks on the back. I'm hoping to have one soon and will take pictures and post more about them. They're $20 each available in Adult and Youth sizes. Please contact me if you're interested. The cows have arrived!! 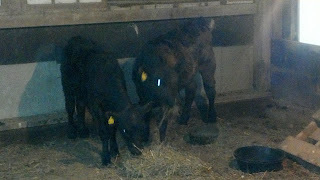 On Saturday, April 28th, I borrowed a truck/trailer from Jen at iTolt Training Center and drove to Innisfree Farm and picked up 2 black angus calves. One is roughly 6 months and the other slightly younger (and smaller). They loaded beautifully into the trailer and I had no problems hauling them back to the farm. That, unfortunately, is where the fun stopped. Instead of fanagling them into the barn (they will be sharing the chicken room til the horses get used to them), I opted instead to put them in the front part of the pasture that I had taped off for them. However, they had other ideas and within 2 minutes of them hitting the ground, they had run through 3 lines of my electric tape fencing and wiggled their way out of the 7 strand wire perimeter fence (that was not turned on as it had been grounding out). For the next 3.5 hours, and with the help of many friends, neighbors and strangers, we chased the 2 calves all around the property (and beyond). I've now seen more of the fields and woods near the farm that I even though possible (even found a creek bed when the big guy was running through it). In the end, the little guy was lassoed after 75 minutes loose by a good samaritan that happened to stop. The big guy was tackled by my neighbor after 3.5 hours on the loose. And while at the same time there were police and ambulance on my road, none of it had anything to do with the loose calves. They are now on a "barn time-out" until I can fix the fencing so it contains them. I'm also using this time to get them used to me. I'll post a better picture when I can, but this is the best one so far (the other had the flash on the eyes and made the little buggers look evil). So meet Q (aka BBQ) and Mig (aka Filet Mignon)... latest residents of Serenity Valley Farm. And with any luck, hopefully very content, quiet and cooperative (from here on out) residents. All beef shares for this year are currently spoken for, but if you're interested, let me know and I'll put you on the wait list in case anyone backs out. Along those same lines, I am still accepting deposits for turkeys. I will be ordering the chicks this month and currently have 15 orders. Remember I'm ordering both the Broad Breasted Whites that I did last year as well as the heritage breed Bourbon Reds. A deposit guarantees* you a turkey although I will be ordering a few extra. I still have an ABUNDANCE of eggs this spring! $2 per dozen. Willing to deliver or meet you somewhere if it's not too far away. The garden is coming along. Plenty of blossoms on the strawberries, the broccoli and cabbage look good and the gutter garden (seen below prior to planting) is seeing plenty of spinach and lettuce starting to pop up. More will be planted on Sunday and I'll post more pictures later. In other news, the first horse show of the season is upon us! Catch me competing with iTolt's Chiraz at several DLSC Hunter Shows this summer... beginning tomorrow. I am excited to not only show and hopefully qualify for year end awards, but to be able to help Jen school her many wonderful students as well.